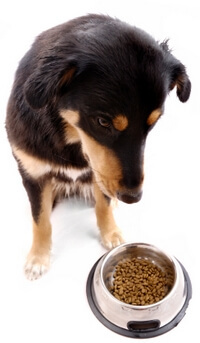 Canned or Dry Dog Food - What's the Better Choice? Ever wondered what’s better? A canned dog food — or a kibble? For me, it took a trip away from home and a call from the kennel attendant that finally helped me solve that riddle. “Bailey hasn’t eaten a bite in two whole days,” she advised. “What would you like us to do? We had gone away for the holidays and had no choice but to leave our little guy with the vet. And now we were worried. Bailey’s recent favorite — a chicken and rice kibble — had been brought along with him to the kennel. But now he didn’t want any part of it. When I called back a few hours later I was relieved to find out Bailey had “gobbled up every bit of it… and even licked the bowl”. Want to know what “it” was? Canned dog food. That was it. Bailey wouldn’t eat the kibble. But he sure did love that wet food. So, I decided to learn more about canned dog food. I knew Bailey liked it. And he liked it a lot more than he liked kibble. But I had to be sure if it was OK for him to eat. After all, I’d always heard that canned dog food wasn’t as good for dogs as kibble. In many ways, canned dog food can be superior to kibble. They typically contain more meat protein than their dry counterparts. Plus, due to their air-tight packaging, canned dog foods contain no synthetic preservatives. So, fats and oils sealed inside cans don’t easily become rancid. And no artificial flavorings and colorings. With cans, meat ingredients are closer to their natural state. So, canned products are more palatable — and more appetizing. Have an overweight dog that needs to lose weight? The moisture content of canned dog food can make the same amount of nutrients (on a dry matter basis) occupy more volume. So, your dieting dog can feel fuller — faster. And what about older dogs? Seniors are frequently afflicted with chronic dental problems that can make chewing dry kibble difficult — even painful. So, canned dog food can be the perfect solution. Now, I know it looks like I’ve forgotten to mention how kibble can be better for your dog’s teeth than canned food. But my own professional background makes that silly rumor difficult to accept. Find out for yourself. Be sure to read “Dry Dog Food and the Myth of Cleaner Teeth” to learn the surprising truth. So, Which Is Better — Canned or Dry? 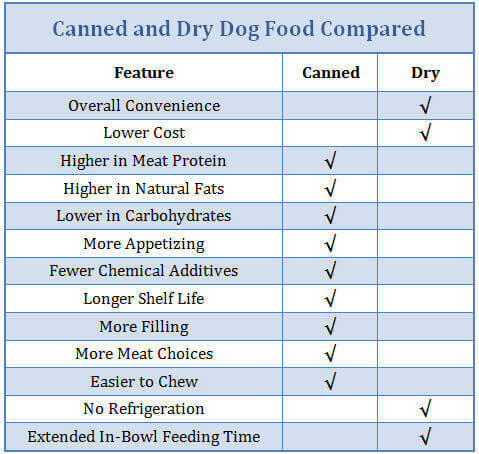 From this chart it seems like canned dog food might be a better choice. But looks can be deceiving. Now, when it comes to convenience, nothing beats kibble. Plus if you’re on a budget (and who isn’t these days) a quality dry dog food is almost always a better buy. Never leave any canned food in your dog’s bowl for more than an hour or two. Unlike kibble, wet foods exposed to the environment can easily grow bacteria — and quickly become contaminated. Of course, every open can must be kept refrigerated. Be sure to discard any unused dog food within two to three days. Now, I hope you don’t think I’m recommending canned food over kibble — because I’m not. There are times when feeding either one or the other may be the better choice for you or your dog. However, there are also times when mixing the two together — a feeding method known as topping — makes an especially tasty choice.